People used to search about blogger education requirements, required life skills for professional bloggers, what skills needed to create a blog? What are the marketable blogger resume skills? How to start a blog? How to become a blog editor? Skills of a fashion blogger, What skills you need to have for full-time blogging? How bloggers need to be successful? What skills you need to look for hiring a new blogger? or blogging skills checklist, and so on. Strong skills make you stand stronger in the competitive world, and this also applies to bloggers too. Every job requires some sort of skill to complete it successfully in the desired time. Like all other jobs, blogging also require some skills. The fact is that if you want to become a full-time professional blogger, you’re going to learn a lot of various things. Few peoples determines that, it's so challenging to be a successful blogger & it is the reason why they later get failed to make money from blogging. It's because they are unaware of the skills that blogging does truly require. They just keep blogging, keep blogging & quit. Every blogger wants to be a successful & professional enough to make money through blogging. But only a few of them who use their skills, develop it on time-to-time become successful & then problogger that succeed to make money blogging. 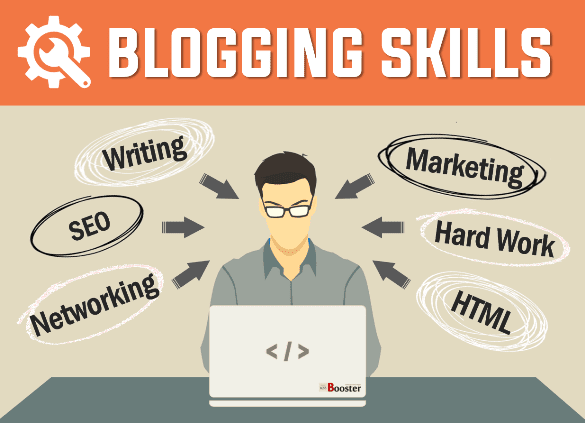 So what are those skills a blogger should possess to become successful? My this article is an attempt to detail all those skills. So let's see top blogging skills checklist that every blogger should know & here I just listed them one by one to become a better blogger. In the previous page I was talking about; Top 18 Advantages & Disadvantages Of Full-Time Blogging and it is must read article to know pros and cons of blogging in case you wanted to be a professional. Also, it is all necessary to know the skills required for full time blogging to lead ahead of the competition. Let's check out quickly what blogging skills you need to pursue to be a successful blogger. Develop Will Power - I know this is not a skill but still you must have a strong will & determination to be a blogger. A "strong will" as because there are some people who are busy in just thinking to be a blogger theoretically & keep thinking. And the "patience" is because some become a blogger but can't last long. Blogging really is a hard task to do. It's not gonna work only because of your thinking. You must have a strong will that anyhow I am gonna get it. Yes, I love blogging, it's my passion. If you see there are lots new trends & ideas for blogging/vlogging, but the purpose for which you are gonna blogging is pretty hard to come by & its fact. Those who start blogging & quit it after some time, they don't seem to aware of such facts about blogging. Like other fields, there are some advantages & disadvantages of blogging but a "strong will" will help you to focus on it regularly & patience will keep you attached to it. Develop Writing Skills and Technique - Blogging is a lot more about the writing work. It requires a great writing skill. Your writing should be simple to read & easy to understand. It should reflect your emotions. If you don't have writing skill, then you will find it difficult to blog. But you can acquire it. Do all your required searches & researches, collected enough information from all the sources, make important points & then make a draft in detail including your points one by one in extended fashion but with your own language. Content should be original enough to get listed in Google search results. All your efforts will be null if your writing is not good enough. Don't do any spelling & grammatical mistakes, use punctuations wherever necessary, make paragraphs at regular intervals. Image Editing Skills - Along with the text blogging, every article also needs images, because a picture is a most powerful way to express the emotions. Sometimes it can explain what is the context all about that probably a thousand words fails to deliver. When a new reader visits the blog, first his eyes get attracted by the pictures and he stares at the images other than reading the whole text. Therefore you should possess a photo-editing skill, but that doesn't mean you need to know Adobe design & Photoshop tools. You need to know how to crop, resize, format the image, and the 'Powerpoint' is the best tool to develop your fundamental and beginner photo editing skills. So edit your blog images; so that they should reflect the theme of your blog as soon as the readers look at those. Editing the photos is one thing, and making an image related to your post is the skill. Building a Professional Network - Networking is a key element of blogging career through which you can get loads of quality & organic traffic to your blog. A strong network stands when you have your presence everywhere & communicate with people around you. Try to be in touch with everyone regularly. Ask what's going on their mind. Having network makes it easy to get more traffic in short time. Have the active presence on the social network. This is the best way to get more traffic. Join blogging community to get connected with the same kind of equal minded people. Marketing Skills That Build Drives More Traffic & Sales - Here the marketing means eMarketing that includes e-promotion & e-selling. Blogging is an online business & every business requires marketing. Those bloggers who have good marketing skills find it easy to promote their blog & attract more users. Market your blog content at the right time, in right manner. Decide your strategies when & how to market your blog. Marketing is one of the best ways to grow your business quick & fast. Try to market your product or services everywhere as much as you can. How much you will market that much return you will get. Let the people know what you have for them, then only they will connect to you. Social Interaction Skills - Blogging is a two-way communication. It's not about writing a text & waiting for readers comments. You need to interact with your readers, reply to their comments regularly. You should also interact with other fellow bloggers in the blogosphere. You need to comment wisely on their posts. Interaction helps to create a strong relationship between you & other bloggers and also with the readers that will undoubtedly increase traffic to your blog. Interaction should be in a proper manner; you should satisfactorily answer readers comments & questions. Building Self Discipline - There is no wonder if someone defines the discipline is a primary pillar of whatever work you do. And as far as blogging concerned, it is the must. Whether you are a part-time blogger or full-time, make a timetable for publishing, researching or editing all that required for blogging & follow all these things daily. You shouldn't compromise with your regular timetable because it may cost you more in terms of visitors and ultimately low revenue nobody wish for. Get on time, work on time & blog on time, don't be lazy. Try to write regularly, consistently & edit, publish accordingly. Discipline is expected to be consistent & a consistent means to go a long way. A blog post of a well-disciplined blogger always heads higher rankings in search and drive more organic traffic ultimately. Hard Working & Quick Learner Skills - Obviously, no doubt, to be a successful blogger or in life, everyone has to work hard, there is no shortcut. Especially if you are a part-time blogger, you need to work very hard. Because you have to do your daily job & then again you need to spend time for blogging. Doing your day to day job shrinks all your energy making it difficult to concentrate again on another job. But there is no option; you have to work hard to be a successful blogger and ultimately helps you to be a PROBLOGGER. Memory, Concentration, Reading & Listening - It is quite difficult to read reader's mind. What have they in their mind? What do they want to know from you? What are their topics of interests? If visitor read your article and find it interesting, then it won't leave it at all, and then that visitor will get converted into the regular reader. So it's important you need to know what is the reader's psychology. What will keep them attached to your blog? You need to convert your words according to your readers. Always try to blog & write articles for your readers and not for search engine. Technical SEO Skills - Last but not least, in order to get your articles listed at the top in search results & bring more quality traffic to your blog site, you need to be familiar with search engine optimization. It's the essential skill that every blogger must have. Writing good content is not enough to get your blog in search results as because if you see, there is a huge competition for every blogging niche, there are so many probloggers posting new blog posts every day in the world of the blogosphere, and they are any way related to your niche too. Therefore it is very important to learn SEO to attract more organic traffic. You can learn it as you go long & deep in your blogging journey. Last but not least, you need to follow most of the professional bloggers in ordert to stay updated in this blogging industry. Subscribe our regular updates to stay tunned with new and fresh content deliverd to your mail. Don't worry we don't spam. So these are the most important skill you need to focus to be a professional in the blogging world. If you have better skills other than listed here that makes a great impact for bloggers then don't forget to share it with us via the comment section shown below.